March | 2009 | RicksBlog.com Home of "The Domain King®"
I understand the power of matching a great domain with great traffic to a company or partner that knows how to utilize it. The variance in payouts is not 25%. It is 2500% 25,000%. Go ahead and laugh. It's fact. I have one domain (eBid.com) that has made as much as $1300/day and as low as $.35/day. It currently makes about $50/day. I know the upside. I have been to the mountain. I have seen it with my own eyes. This was not isolated to a single domain. However the extremes on this particular domain are the biggest and help illustrate the playing field better than any other. For folks that don't believe this, ok. But you would be wrong and you won't take much away from this post. I have been under an extraordinary amount of pressure from folks to come out with the agenda for TRAFFIC over the last couple of months. Several topics have been discussed. But at each point I was reluctant to plan the agenda. See I believe something would materialize. Something specific. Something that would be quite important to anyone that has income producing domains. But what I saw was no guarantee that is would happen and happen before April Well what I envisioned would happen finally unfolded LAST WEEK! See I believed in the fall that it would take 6 more months of bleeding before domainers and others looked for a serious alternative. That day has come. There will be a multitude of new solutions coming to domainers next month. Just one winner can completely change the industry overnight. We all wish these companies well. What I can say to these companies is make sure your solution is just not replacing the same revenue stream. The minimum increase folks should see is 50%, 100%, or more to be viable. I see what we have in prime domains as an oil well. A diamond mine. The treasure is there. The market may fluctuate. The costs of extracting may be higher or lower. But the treasure is still there. The treasure on that domain is still there and when matched to a good mining team can be extracted. Then again the traffic that is lost today, is lost forever. You can't reclaim what you already lost so time is of the essence. We are in the midst of a great shift in traffic. Traffic is migrating away from PPC. That sector which was once the most dynamic is now showing signs of strain. There will be a breaking point and we will all witness it first hand. Some may even emerge stronger. But there will be less players. That is for sure. The point is what was important last fall has little import now. Same things with each month since New York and in some cases each week. All along I knew that the show should be about new monetization alternatives. But that was not up to me. It was up to evolution and destiny. BINGO! The thing I saw unfolded and now we have the beginnings of the next phase of monetizing domain names. In good times there is no motive to dig deep within us to do something great. When you witness your earning decline and you come to enjoy the comforts we have had, that provides the motivation for folks to not accept the status quo. So while it has yet to happen or unfolds, it will be the next 12 months or less that changes the entire industry. Domainer are stepping up and doing a wide variety of things. We will be hearing from a wide variety of speakers and they will be announced during the next few days and the week ahead. So trust that when we have an agenda it is geared to what is important at the time of the show as well as the coming months. We hear all the time that shows pick an agenda 6 months or a year before a show. All I would say to that is I have never foucsed on yesterday's news. It is seeing the news before it is news. The next 6 months. The next 12 months. Just look how much the world has changed. So I would have announced what the show was about in September in New York. But the universe had to cooperate. And so it did. The industry is ripe for a new big thing. How much will the delay cost you? SantaClara.com to be Auctioned at Santa Clara T.R.A.F.F.I.C. Moniker has sent me a few blockbuster names and I am happy to announce that SantaClara.com will be auctioned off at the Silicon Valley TRAFFIC that will just so happen to be held in Santa Clara in just a few weeks. Won't that be interesting? Here is an open invitation for the Mayor or City Manager of Santa Clara to attend the auction. Make sure to bring your Budget Director. Same with the local newspaper, travel agency, or anyone else that has an eye to the future and a sense of opportunity. This is just an example of some great names coming to market. The submissions we have been getting are extraordinary and many more will be announced over the coming weeks. I wonder what Einstein could have done had he been in his prime today? Einstein with a computer and a website. Ben Franklin with the all the things he invented. Christopher Columbus with a GPS. Alexander Grahm Bell with an iphone. Each day we follow in the footsteps and along the path that they forged. They did it with such little to work with. Then again, that may have been their strength. connecting the early dots. Who knows? Certainly they would be taken back by how their contributions have changed the world. Let's face it, we are a bunch of lightweights compared to these heavyweights of history. A bunch of pussies. I also think they may have been ordinary. Some folks are stronger in their abilities at the beginning. What do I mean. Well a great builder of homes may not be a great decorator. What he does is build homes. That is his strength. It does not necessarily translate. But I do believe these great men would be great men in any era. So with that as a basis you start to wonder what could these builders of civilization do with the tools of today? What could they have achieved? Are we worthy to carry the mantle? How much has been lost in translation? For example the difference in folks that need a calculator to add, subtract, multiply and divide and those that go thru a mental process in their head. Both may have the same answer, but the way they got there was totally different.So I see differences and similarities where others do not. We are already past where those four men were the minute we wake up in the morning because of the gift they left all of us. So when I look to history and these men in particular it gives me great strength and also illustrates why I keep saying patience is the key. My job, your job is to accelerate the future. Because none of us will be alive to see how the Internet will evolve in the next 100 years. Welcome to what may become an institution on the net. Then again this may be the only Sunday this ever runs. You will decide the fate. I have an idea for a column each Sunday called Ricks funnies. Each week I will ask posters to submit the stupidest thing they saw this week. It could be in domains, business, politics or just some mistake a local business made. In that spirit please list your example. My example this week is this idea. What a stupid idea. The chances of it working are minimal. But it is up to you, not me whether this works or not. Have at it. get past which mountain to move. So we are paralyzed and powerless. duplicate many times over and in a variety of endeavors. but the way I have always seen it is in this picture I draw. he can to push the truck over the crest. ALL are failing. Not a one has budged. They are stuck. Paralyzed in time. are losing money by not getting the goods to where they need to go. will still work, it would have had more significance a few years back. develop at different speed, at different levels and for different reasons. I have had this vision for YEARS. success after success after success. the rage and most of us have several of them operating. Maybe several hundred. first hit. It's not easy to create a success. Lately it has been more difficult. starts one month from today. interesting changes. These companies are aiming to double, triple and quadruple your incomes. that has a new solution. But it must be new and it has to have some credentials. But don't count out the ppc companies. My sources tell me they are also working on things to stem the tide. We all know how much of a decline we have seen. One new solution by any of these companies has the power to disrupt the entire sector. It could put companies out of business virtually overnight. The market is fragile and no sponsor could afford a mass movement of traffic and survive. So can 2 days at TRAFFIC double your income? Yes it can. There has really never been more at stake. I often tout patience as the key to the domain industry. Some ask how patient should we be? Well let me take a moment to calibrate your mind. In 1876 Alexander Grahm Bell invented the telephone. It wasn't until some 131 years later that the iPhone was invented. So that is a little longer than most of us can afford to be patient. So my job, our job is to accelerate things the best we can. Now on to the subject of the post. Funny thing, a few weeks ago I was seriously thinking for the first time to change to a Mac from IBM. Sony's are slick but support is as bad as it gets. Dell is solid, but the XPS I have is weird and they always seems to be a little behind the curve. HP? Just too many horror stories out there to buy one. IBM? Toshiba? Not too exciting. So I decided I was going into the Apple store and see if this was going to be easy or a root canal. on his new Apple Laptop a couple days later and see I am not the only one thinking the same thing. I have been considering the Mac for one reason and one reason only as I have tried it many times over the years and never had a good result. However the iPhone has made me a believer. If folks are still using your beloved blackberry, get an iphone just to play with. It won't take long to win you over. 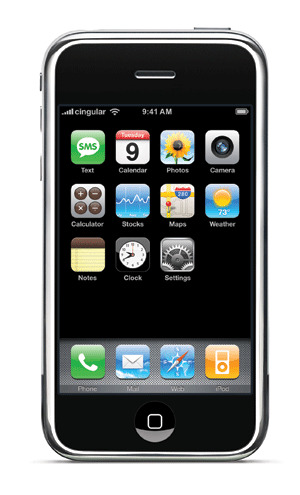 The iPhone is so over the top that I believe that alone will be responsible for giving Apple a much bigger market share. I am proof. I am such an iPhone fan and now it is spilling over to their other products. I think I am one of millions like that. One of more millions to come. Talk about a solid company. This is it. No matter where I am the Apple Store is always packed. The energy level is always high. I have had 2 Macs and it just must be which side of the brain we use or something. I failed both times to make the leap. They say the 3rd is a charm. I don't have a very developed artistic side. I was probably the only one in history to flunk art in college. I think the choice was dropping the course or getting an F. I think I dropped the course and not long after dropped out all together. I mean how do you flunk art? I showed up. I think I showed up. It's a long time ago, maybe I forgot to show up kinda like forgetting now or forgetting the subject matter at hand. Point is my artistic side is not as developed as my analytical side and I believe that is what is responsible for my failure to embrace an Apple computer. But the iphone has won me over. I am a big iPhone fan. I really love the device. The ease and power is really over the top. Other devices do the same thing 'Most of the time' but the iphone does things fast and seamlessly. I can stop at a red light. Check my email, check the market, check stats. Answer an email and more just at that light. I can't get that far with my Blackberry. The Blackberry sitting and collecting dust. I think we need a World Championship of handheld devices. Put them thru a battery of real world tests and have folks compete. Actually, there is really no need, iPhone will walk away and we can get a beer while the Blackberry is still trying to get to the first link. ok, that part of the post was written 10 days ago. I ordered my Mac from Mac Mall with vmware's fusion software preinstalled. ok, booted up and connected to the net. Hurdle one done! I am not a cold turkey kinda guy like Mike. I am more of a migrator. I do it a little bit at a time. So with Mike's post as a guide book I was able to find a few answers with no pain at all. I am about 85% through it and most of the rest is pretty easy. The migration was really no different than buying any other new computer. There were a few things to learn on the mac. The command key for one. The keyboard is the best I have ever used. Period. The feel is good and mistypes have been reduced a whopping 90%. That really helps the time and frustration of goofing up all the time. So far the only program not behaving well is there seems to be no utility to convert Quicken files from IBM to Mac. So until that changes, it's really no biggie as Fusion makes windows run seamlessly. So who cares? Some little quirks. I would say less than 5 and I think they can be easily rectified with a quick call. So the things I have found are tiny in comparison to the benefits. I need no support whatsover to migrate. Mike's post was all I needed. If you love your iPhone you will love your MacBook Pro. If you work on a Mac and don't have an iPhone then you need to get immediate shock therapy or go to the store asap. It's coming on 2 years and I can absolutely say that the iPhone is the best device I have ever seen. When you think of a few improvements, it gets scary. There is no question that I would have never switched to Mac if it had not been for the iPhone. The phone that sells computers. The phone that gets market share. The phone that is hurting Dell and Sony and HP and all the rest. One company getting more market share while many companies fight over a shrinking market. Can Apple finally be on the threshold of winning the war? The one thing I could never figure out is why some would waste their energy rooting for others to fail. In this industry, a failure for one is a failure for all. A success for one is a success for all. See folks need to take a step back. We are trying to attract outsiders and end users. Well if that is what we agree that we want the most maybe we need to look at it through their eyes. Maybe we need to see what they see? I think so. So what do they see? Do they see John the domainer? Do they see a domain industry? No, probably not, they see a group. They see a singular not a plural. The only plural they see is cyber squatters. So they see that first. The masses see that first. Even folks at Yahoo and Google viewed us that way back in 2004. We have done a good job in changing that perception. But don't think for one second that they did not pigeon hole all of us. But as you become exposed to us and what we do they soon realize just like cheap wine and collectors wine there is a huge difference. Learning those differences doesn't happen overnight. We don't have that luxury with most others. We will win them over one at a time. Each time one comes over to the dark side, we all share in that success. The secret is taking that one success and multiplying it. Each of us are ambassadors for the industry. Multiply one success by the 500 movers and shakers and instead of destiny controlling us, we can control destiny. The power we have is unfathomable. Unfortunately we have never taken the time and energy to harness that power. That is a failure we are all a part of. That is a failure that we can still turn into our greatest success. while they try every other number, I will stubbornly stick with my answer of 4.
infinite numbers. The answer is 4 and maybe it is time to find out why. can't handle reality so I give them a choice. Tonight, no sugar coating. world go round. Simple, give me money, I'll give you 'X' and everyone is happy. construct. Those sales require a formula that offers benefits to both parties. certain elements in it. EVERY sale I have made with domains had this element. limbo and then make a legal claim. So the contract is more than important. have a piece of the puzzle that can change that. So no, it is not Hershey's.